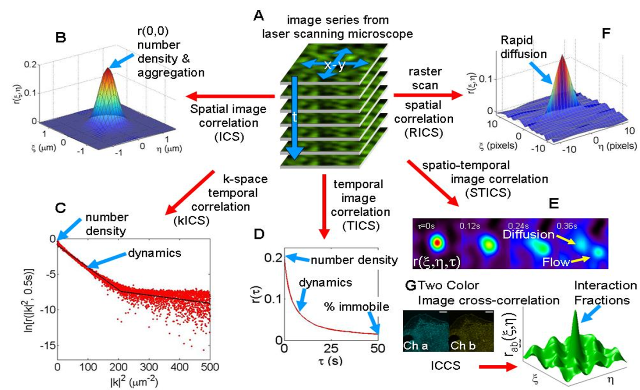 ►Development and cellular applications of imaging based fluorescence fluctuation methods including image correlation spectroscopy (ICS), moment analysis, and spatial intensity distribution analysis (SpIDA) to measure receptor transport, densities, and oligomerization state within intact cells. ►Characterization of cellular signaling, receptor transport and protein interactions in living cells and neurons with application to cell migration, signal transduction, axon pathfinding and synaptic formation. ►Application of new nonlinear microscopic techniques such as second and third harmonic generation (SHG/THG) microscopy for imaging extracellular matrices, characterizing wound healing, metallic nanoparticles and for detecting malaria infected blood cells. 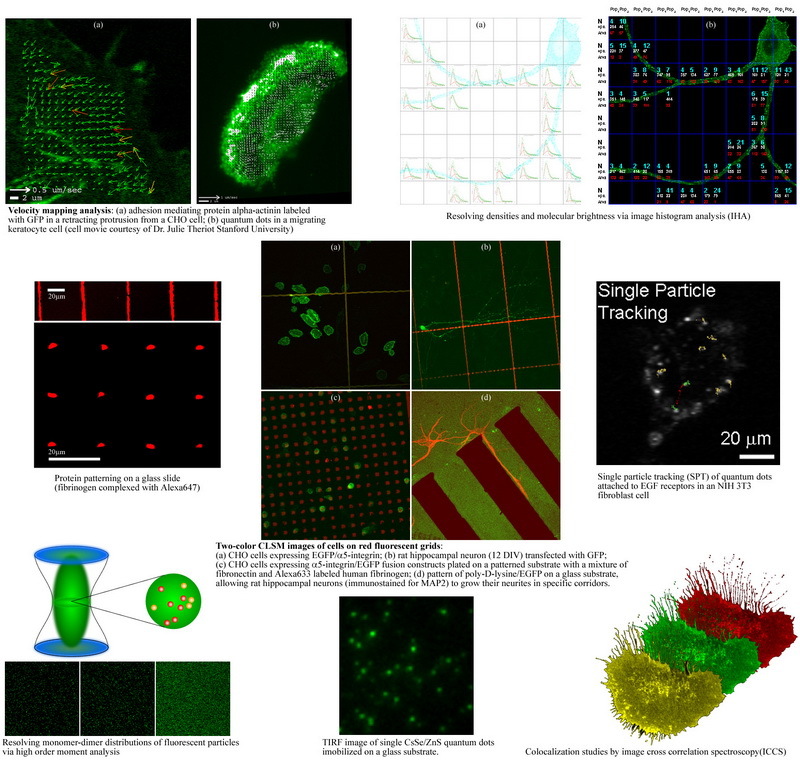 ►Application of nanoparticles for fluorescence fluctuation and single molecule measurements in living cells. ►Light Sheet Microscope - 405 nm/ 488 nm/ 561 nm/ 594 nm/ 640 nm laser lines, with 10X/ 25X/ 40X objectives and an Andor Zyla sCMOS camera. This microscope is typically used for imaging of tissue clearing specimens, such as mouse embryos. 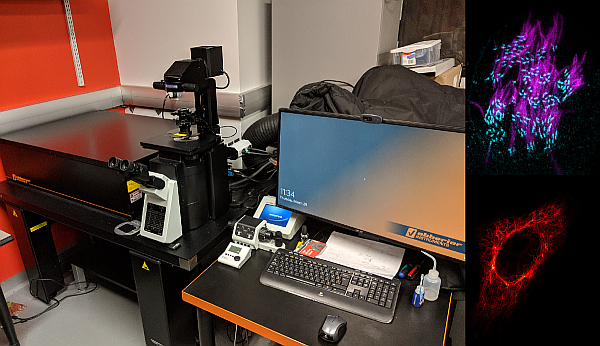 ►Total Internal Reflection Fluorescence (TIRF) Microscope - 405 nm/ 488 nm/ 561 nm/ 594 nm/ 640 nm laser lines, with 100X objective and an Andor iXon EMCCD camera. 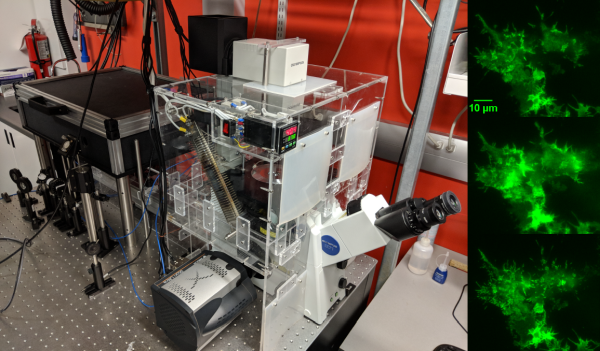 This microscope is focused on visualizing membrane receptors dynamics in live cells, as we have enclosed the microscope in a homebuilt heated enclosure. ►Multiphoton Microscope - Verdi V18 pumps a Mira 900F for two photon 780 nm excitation, which pumps the Mira OPO for tuneable three photon 1050-1300 nm excitation. We have a 25X objective, with emission filters centering 400 nm/ 480 nm/ 535 nm/ 600 nm, and 2 detection PMTs. 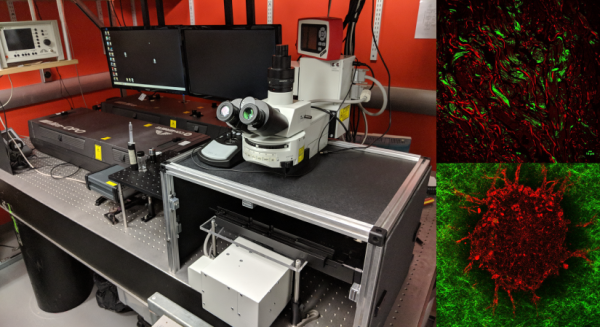 This microscope is used for label-free imaging, including imaging via second and third harmonic generation contrast mechanisms and two photon autofluorescence. ►Stimulated Emission Depletion (STED) Microscope - Abberior 3 channel STED/ confocal microscope with 775 nm STED laser, 405 nm/ 488 nm/ 561 nm/ 640 nm excitation lasers, and 3 APD detectors. This microscope is focused on super-resolution imaging using the STED module, for detecting molecules below the diffraction limit. The image time series are essentially a record of fluorescence intensity fluctuations that contain complete information on both the absolute molecular concentrations and the dynamics/kinetics of the labeled molecules. Statistical Mechanics provides the theoretical foundation for the extraction of this information by methods known as fluctuation spectroscopy or fluorescence correlation spectroscopy (FCS). We use novel imaging variants of FCS: image correlation spectroscopy (ICS) and it's many variants. Copyright (c) 2013 Wiseman Research Group. All rights reserved. Website maintained by Angelica Gopal.